This sleek, space-age stainless steel take on a saber from Menu is proof that a champagne saber doesn’t need to be sharp to get the job done. It’s the impact that matters, after all, not the sharpness of the blade. The fine art of sabrage — the fancy French term for opening a champagne bottle with a blunt sword rather than the standard humdrum method of just popping the cork — purportedly gained popularity during the reign of Napoleon. His conquering calvary would slice open bottles with their sabers to celebrate their many victories. 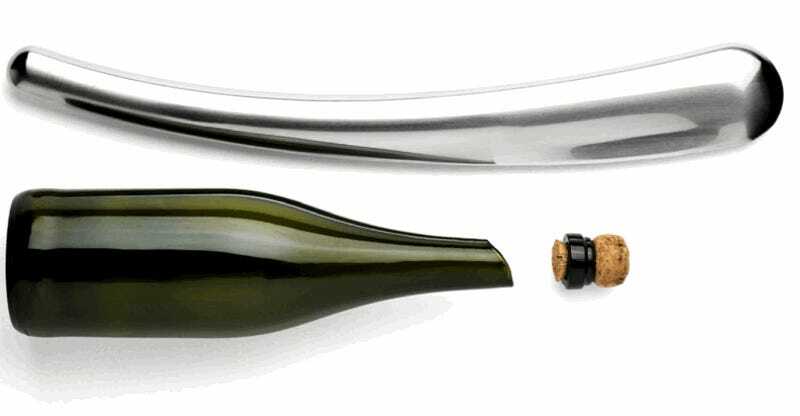 These days it’s the job of well-trained sommeliers, although the ready availability of tools like the saber pictured above is making sabrage more popular among amateurs. Prices for champagne sabers run the gamut from around $50 to $900 or more, depending on how fancy you want to get. You can snag this little beauty for a relatively reasonable $149.95.